Rinat Abdullin recently posted about Mighty Moose and AutoTest.NET, two projects for continuous testing in the .NET/Mono space. My interest was immediately piqued, as I'm a huge fan of continuous testing. I've been using py.test to run my Python unit tests for years now, almost solely because it offers this feature. I'm taking a look at AutoTest.Net first. Mostly because it's free. If I'm going to use something at home, it won't be for-pay, and the Day Job has been notoriously slow at shelling out for developer tools. Update: there was a bug that had been fixed on trunk, but not in the installer that I used. AutoTest.Net is better at detecting broken builds than I report below. Download and installation were straightforward. I opted to use the Windows installer package, AutoTest.Net-v1.0.1beta (Windows Installer).zip. I just unzipped, ran the MSI, let it install both VS 2008 and VS 2010 Add-Ins (the other components are required, it seems), and that was that. That's it. Well, for the basic setup. I opened a command prompt to the root of a small project and ran the WinForms monitor, telling it to look for changes in the current directory. I mean, it makes sense. I have neither built nor run yet, so what did I expect? Still, I was taken aback by the plainness of it. Only temporarily daunted, I then hit the tiny unlabelled button in the northeast corner and got a new window. This was less scary. Everything seemed to be in order. I hadn't specified MS Test or XUnit runners, nor a code editor. It says it's watching my files. So let's test it. It's supposed to watch my source changes and Do The Right Thing. Let's see about that. Next I changed the text in one of the core files - this file is part of a project that's referenced by the BookFinder GUI project, and the test project. Again, this was a cosmetic change only, just to see what AutoTest.NET would do. It did what it should - built the three projects and ran the tests. See? So, now I'll modify the core code in a way that breaks a test. It picks up the change, builds, tests, and does a really nice job of showing me the failure. 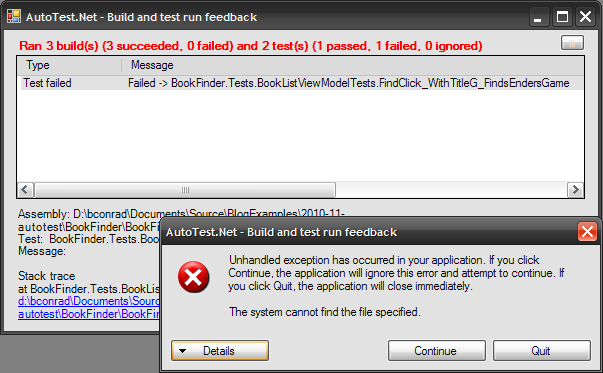 I see the test that failed, and when I click it, am presented with the stack trace, including hyperlink to the source. That was a little disappointing. On the brighter side, hitting "Continue" did continue, with no seeming ill-effects. Confession time. I hadn't checked the CodeEditor section of the configuration file. As it turns out, it had a slightly different path to my devenv than the correct one. I fixed up the path and tried again. This time, clicking on the hyperlink opened devenv at the right spot. So the problems was ultimately my fault, but I can't help but wish for more graceful behaviour - how about a "I couldn't find your editor" dialogue? Ah, well. The product's young. Polish will no doubt come. 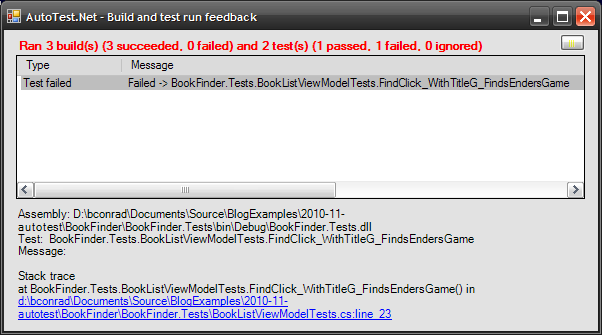 I repaired the code that broke the tests, and AutoTest.Net was happy again after rebuilding and rerunning the tests. For my last test, I decided to actually break the compile. This was kind of disappointing. It claimed to run the 3 builds and the tests, and said that everything passed. I'm not sure why this would be - I was really hoping for an indication that the compilation failed, but nope. Everything was rainbows and puppies. Spurious rainbows and puppies. There's an add-in. You can activate it under the "Tools" menu. It looks and behaves like the WinForms app. [Info] 'AutoTest.Console.ConsoleApplication' Starting AutoTest.Net and watching "." and all subdirectories. [Warn] 'AutoTest.Console.ConsoleApplication' XUnit test runner not specified. XUnit tests will not be run. [Warn] 'AutoTest.Console.ConsoleApplication' MSTest test runner not specified. MSTest tests will not be run. Not bad, but I have no stack trace for the failed test. Just the name. I'm a little sad to lose functionality relative the WinForms runner. I know I wouldn't be able to click on source code lines, but still. Honestly, with a GUI or text-based component around, I'm not sure how much benefit this will be, but I guess I can minimize the main window and so long as tests keep passing, I can get some feedback. Still it's kind of fun. I really like the idea of this tool. I love the idea of watching my code and continuously running the tests. The first steps are very good - I like the clickonable line numbers to locate my errors, and I think the Growl support is cute, but probably more of a toy than an actual useful feature. Not now, and probably never at the Day Job. The inability to detect broken builds is pretty disappointing. Also, at work, I have ReSharper to integrate my unit tests. I've bound "rerun the previous test set" to a key sequence, so it's just as easy for me to trigger as it is to save a file. At home? Maybe. If AutoTest.Net starts noticing when builds fail, then I probably will use it when I'm away from ReSharper and working in .NET.